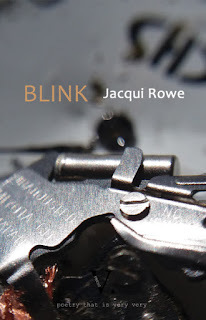 "Blink showcases Jacqui's range, both emotionally and culturally, from occasional poems and ekphrasis to responses to Apollinaire and Verlaine; all held together by a characteristic clear-sightedness. Drawing as it does from Jacqui's previous publications, her first 'proper' collection is arguably a 'New and Selected', but it still feels remarkably cohesive." David Clarke, A Thing for Poetry, full article and listings here.